We are back in Samui, un-doing our 11 hour time adjustment to two weeks in NYC. Of course, it was only in the last 3 days there, that we made it out to a 10 am museum opening, and didn’t have angry hotel guests complaining about the, “two bratty kids screaming in the hallways in the middle of the night.” Central Park at 6 am became our hang-out as well as The Disney Store at Times Square. And not a person looked at me twice for pushing a double stroller down 7th Avenue at 1 am. In fact, there were lots of other little kids at the store dressing up as Rapunzel and Ariel waving their wands at the magic mirrors. The first few days adjusting to a 180 degree shift in time means that at least one of the four of us is asleep during all 24 hours of the day. What might be naps are a little longer than usual. “Sleeps” are a bit shorter than a typical full night. While one twin is having a nap, the other is playing then falls asleep for the “night”. And then the napping twin wakes up, is ready to snack, play, have dinner, then sleep for the “night.” Soon after, the other wakes up for the “day.” One of us adjusts to Paris time. The other stays at New York time. Phew, we’re finally all back in Samui! Here’s a post I wrote a year-and-a-half ago about some jet-lag experiences of our family trip from China to Canada. It’s early September, 3 am, in downtown Montreal. The night-streets abound with young people, bar-hopping, club-hopping, bunny-hopping; many strange things happen during Frosh, the first week at university. Teenagers go out in teams to discover the city, and each other. This year we are part of the drunken masses, 10 years, OK, well over 10 years after we were freshmen here. But this time with a twist. We’re with our almost 2-year-old twins. The thing is, 3pm in Chengdu, is 3am in Montreal, and like most toddlers, Leila and Rahul need to exhaust their post afternoon-nap energy surplus. I clearly remember three o’clocks decision time: coffee, pizza, or shawarma? Home or an afterhour’s club? The children could do with an afternoon snack. We head to my favorite 24 hour café on Park and Milton, bang in the student Ghetto. We stroll past the smokers on the terrace, and push through the café’s narrow, double doors. You’ve got to get through one, and then another door. It’s when you have a double stroller that you notice these things. We sit next to a man with dreadlocks, cup of coffee in his hands; working on his laptop, and studying through massive text books. He smiles. I ask for 2 hot-chocolates and an opinion of the café’s least-sweet chocolate cake. A man with the Second Cup logo embroidered in gold on his black t-shirt grins. “It’s chocolate. It’s all sweet,” he replies in his tall, blond, Russian accent. I get a bagel and cream cheese. Leila and Rahul can’t sit still. No surprise. We are fresh off a 30 – hour trip, and a full day at home. They pull on the leaves of a large plant, run around leaving a trail of crumbs. I clean up behind them. Three young guys in smart, blue jeans, and preppy t-shirts, gelled hair and all, peer into the café windows. One is holding a red rose; he’s serenading a couple of young women who’ve just walked into the café. The two girls in high heels and tight, short skirts are not amused. Leila and Rahul watch intently. Are you out of your mind? I should call Social Services on you. I smile, walk into the booth with Leila. Change her diaper. Repeat the process with Rahul, pee myself, and we head out. If only she knew. Rahul and Leila insist on walking back. Of course that means they explore every stone, leaf, and empty beer bottle along the way. Despite our pace, we pass the 3 guys from outside the café, there’s a waft of alcohol in the air, rose still in hand. They’re arguing about something. “Shouldn’t they be in bed by now?” one of them slurs. With Leila on my shoulders, Rahul on Maher’s, we enter McGill University through the Milton gates, all very familiar to us. The crickets are doing their thing; the stars theirs. At first sight of the football field, the children throw themselves head-first off our shoulders. They pick up some wet maple leaves and run around the field like crazy kids. Moments later, we’re all running. Amidst our excitement, we almost miss a couple walking by: a man tightly holding a woman in an elegant green dress with matching heels. She’s wearing her partner’s black jacket. There are uncomfortable glances. The woman leans even closer into her man, and whispers something. Well, it is 4:30 am, and we’re on campus playing with our toddlers. 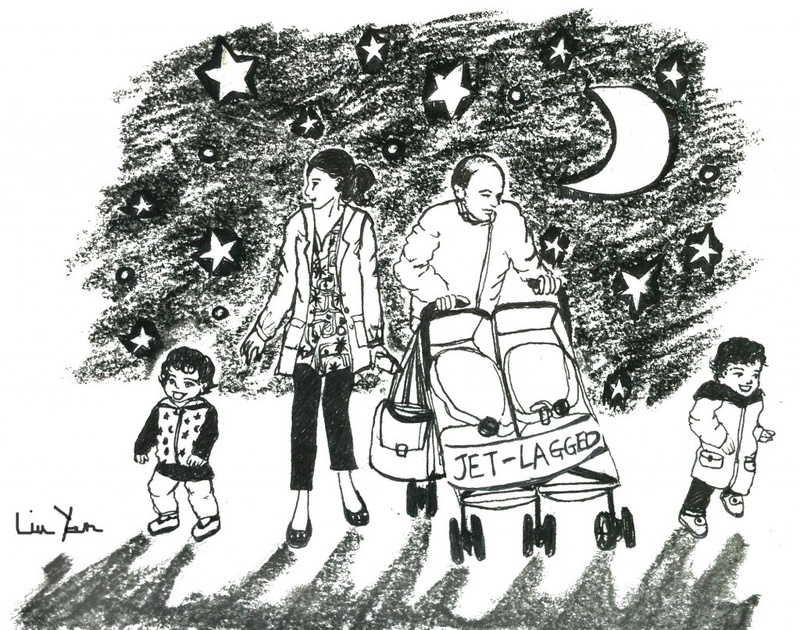 Maher suggests that we paint a “Jet-lagged,”sign on the stroller. We both laugh. While Maher and Leila are still running around, I introduce Rahul to James McGill. Rahul manages a quick wave and a forced hi. The statue of Mr. McGill, small as it is, can be scary at this time of night. While I pick Rahul up, I notice a security guard watching the 4 of us intently. He’s standing upright, muscles flexed under his all-black outfit. He fidgets with his flashlight as he waves it around. We all meet at the stroller and decide to head home. Just outside the gates, Leila asks for milk. I prepare it quickly. Then Rahul says “num num.” Think fast. It’s lively at Amir, the Lebanese sandwich joint on Maissoneuve and Cresecnt. I wait outside with Leila who is fast asleep by now. Maher and Rahul order some food. A skinny woman, with dark circles around her protruding eyes sticks her palm out. She asks for change in a hoarse voice. The wind blows through her stringy, brown hair. She looks defeated; she’s one of the city’s many junkies. A young man who must have spent his night clubbing on Crescent Street, motions her through the large open windows, to wait. He puts what’s left of his fries, pita bread, and chicken into a brown paper bag, and hands it to her. She wolfs it down. A moment later, Rahul has his first taste of a chicken shawarma sandwich, and of potato squares sautéed in garlic and coriander. The hummus makes him scrunch up his face. “Too much garlic?” I ask. Over the next few days, many things taste like garlic. As we climb the hill, close to home, Rahul falls asleep. It’s 6:15, I can still catch the Mysore class at the Ashtanga Yoga studio a few blocks away. My body is warm and flexible from the night out; my mind tired and ready for sleep. The yogis around me are fresh, ready for the day to begin. Natasha: I am mum of 3-year-old twins Leila and Rahul, recently moved to Koh Samui, Thailand after 7 years in China. Just started teaching yoga part-time again. My first class back last week, after NYC, was 4 hours after I got off the plane. I didn’t believe I’d make it through my heavy eyes! © 2012 Multicultural Mothering. All rights reserved.